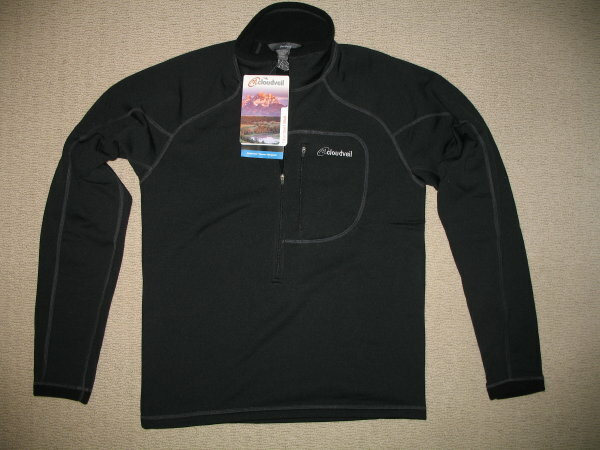 The Cloudveil Run Don't Walk 1/2 Zip (hereafter called pullover) is a fleece base layer made of Polartec Power Stretch fabric. According to Polartec, this fabric features a smooth but durable nylon outer surface that is wind and abrasion resistant and a soft inner layer that is designed to pull moisture away from the skin. Cloudveil adds that the fleece fabric "traps heat, sheds light moisture and compresses when crammed into small, packed spaces yet still stretches when testing". There is a tag inside the pullover that describes this fabric as being 88% polyester and 12% spandex. This same tag lists the wash and care instructions for the Run Don't Walk 1/2 Zip. The instructions are as follows: Machine wash cold with like colors using mild soap. Do not bleach. Do not use fabric softeners. Air dry or tumble dry low. Do not iron and do not dry clean. The pullover has a 16" (40 cm) deep chest zipper and a zippered chest pocket. The chest pocket is approximately 4" x 6" (10 cm x 15 cm), which is large enough for a small wallet or map. Both YKK zips lock in the up and down positions so they do not rattle around while moving. All of the seams are flatlock sewn and my first impression is that they are very comfortable. Since flatlock seams allow the stitching to show on both sides of the garment, it provides some contrast and styling. 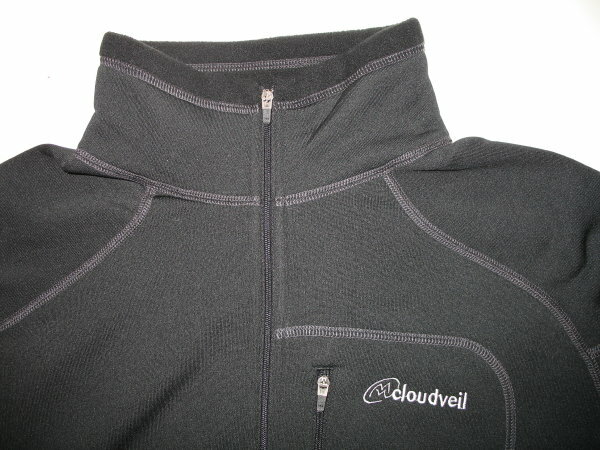 This pullover has the Cloudveil name and logo in white thread on the chest pocket as well as the logo in the upper back area just below the neckline. My first impression of this pullover after removing it from the shipping container was very positive. It's obvious that a lot of attention was spent on detail. The sewing is meticulous with no loose threads or pulls and the overall appearance of this pullover in black with contrasting seams is awesome. After reading on Cloudveil's website that this pullover has a trim and shaped cut, I decided to order a size medium. The fit is slightly relaxed and very comfortable to wear. I may have been able to get by with a size small, however, I wanted the option to wear a lightweight Power Dry baselayer underneath it. As it stands, I can easily fit my vest and other mid layer clothing over it with no problem whatsoever. The sleeves are a little long as you can see in the photo and so I have simply doubled them over. The deep chest zipper allows me to easily take this pullover on and off. The pullover is lightweight but it is definitely not see-thru. After wearing it around the house this morning, the fabric seems dense enough to provide some heat retention. I will be investigating this further as my testing continues. The inner fabric feels good against my skin. It is not scratchy or rough at all. The pullover has gussets located under the arms which eliminate a seam in my armpits and allow me a full range of motion with no binding or bulk. They also allow a good fit in the shoulder area and eliminate seams on the top of the shoulders where they could become irritating while carrying a pack. The flatlock seams are wonderful. This is the first time I have worn a garment with flatlock seams and although this pullover is a slim fit in the armpits, I have not noticed the seams the entire time I have been wearing it. I expect to use this pullover extensively while backpacking and day hiking over the next few months. Since temperatures are already dipping into the 30's F (O C) I will be using this pullover as my primary base layer for all outdoor activities. This concludes my initial report. Thanks to Backpackgeartest.org and Cloudveil for allowing me to take part in this test. I have worn this pullover on several multi-day hiking and backpacking trips over the past two months. I used it as my base layer, directly against my skin. While backpacking, I wore the pullover underneath a fleece jacket and a wind proof shell. While relaxing during evening hours, I replaced my windproof shell with an insulated shell in order to maintain body warmth. I have taken several day hikes in Ohio and Wisconsin. These hikes have been 3-5 miles (5-8 km) in length with temperatures averaging 35 to 40 F (2 to 4 C). Conditions were generally clear or slightly overcast. The terrain was wooded, with a few small hills and elevations around 640 ft (195 m). Once again, I usually wore the pullover with a fleece jacket and windbreaker. I also wear this pullover while biking and for casual wear at home and around town. Use: This was a Boy Scout trip and it normally would have involved lots of hiking. However, we spent much of the weekend under tarps because of the weather conditions. I layered a fleece jacket and raincoat over the pullover. Brief Comments: This was a cold, wet trip. The pullover went through some nasty weather, but it kept things bearable. Use: This trip involved hiking on hilly terrain for several miles, and then lounging and camping out on a hill side. I layered the pullover under my fleece jacket and a wind shell, and sometimes under an insulated vest. Brief Comments: Several times while hiking I began to heat up, but each time I would simply unzip my jacket and the pullover and I would cool down within a few minutes. Use: This trip involved bushwhacking into my campsite, and then sitting around a campfire at night. I layered the pullover under my micropuff vest and a fleece jacket. At night, I wore an insulated shell over the fleece jacket. Brief Comments: This was a great trip with my favorite weather conditions. Once again the pullover kept me warm and dry. I've enjoyed the versatility of this half length zip up pullover. It allows me to zip open the chest area for ventilation as needed and to zip it closed for maximum warmth in chilly breezes. 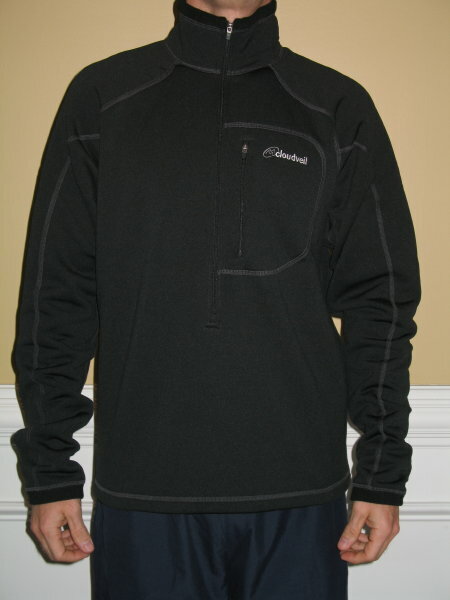 The front zipper provides a great way to vent body heat and moisture from this pullover. This has been a benefit during high energy activities such as backpacking, setting up camp and hauling firewood. Because the pullover also breathes well, I rarely generate enough heat to sweat. I like the way this pullover wicks away moisture. I can do hard uphill hiking and the pullover will get damp, yet my skin does not feel wet. I also find it dries quickly once I slow down. During the wicking process, I do not get chilled and the pullover does not feel damp or cold. When used in cold weather with the proper outer layers, this pullover keeps me warm. It does a great job of trapping heat inside the stretchy fleece fabric. I can keep additional body heat contained by zipping up the collar around my neck. When temperatures are around 35 F (2 C) and calm, I wear this pullover with a fleece top. When it gets windy, I add a wind proof jacket. When temperatures get colder, I add an insulated vest under my fleece top or replace my wind proof jacket with an insulated parka and I'm comfortable again. This pullover is not water resistant but it will briefly shed light snow and drizzle. Due to its fuzzy outer surface, moisture eventually builds up and it soaks through. My one complaint about this pullover is that the sleeves are too long. They extend 3 inches beyond my wrists. If I simply push them up, they slide right back down over my hands. Therefore I need to fold over some of the fabric to prevent this. Aside from this minor annoyance, the pullover is soft and very comfortable to wear. I have worn it alone and as a base layer and it performs well as both. It is not too tight and is comfortable without being restrictive. The collar area is comfortable whether zipped or unzipped, and I have not had any trouble with the zipper poking me in the chin or throat. The shoulder area feels very comfortable, and I have not noticed any rubbing or chafing with the seams. As a matter of fact, this pullover is so lightweight that most of the time I hardly notice that I have it on. I think the stretchiness of the fabric has alot to do with this. And although the fabric is stretchy, it does not appear to stretch out of shape. I am not the best candidate for evaluating the subject of odor resistance because I do not perspire alot. All I can say is that I have had no problems with this pullover retaining odors. When going on multi-day trips I wear it the entire time except at night when I change clothing before crawling into my sleeping bag. At home, I've worn it for a full week in between washings. The soft, fuzzy face on the inside of this pullover makes it difficult to put it on over a short sleeve shirt or other lightweight base layer. However, it is intended to be worn next-to-the-skin and so this should not be an issue. However, I expect that someone who is sweaty would have a difficult time getting this pullover off. To test this theory, I climbed into my shower to get wet and then put on the pullover. Sure enough it was much more difficult to get off because it tended to cling to my body. The stretchiness of the fabric did not help in this regard. Since the fabric is smoother on the outside, it has been easier to layer fleece tops over it. It easily accommodates my synthetic vest and fleece jacket. My mid layers slide smoothly over the pullover without problem. Cleaning is quick and easy. After multiple washings, this pullover has shown no signs of fading or other color changes. It cleans well, dries quickly after laundering and does not appear to shrink. So far I have had no problems with durability. The seams are still tight and the material edges have not frayed. The collar and wrist seem to hold their shape well and I haven't noticed any stretching either. Finally, there is no pilling or deterioration of the fabric or any loose threads. The stitching and workmanship are still fine. The Cloudveil Half Zip pullover is a versatile addition to my clothing system. It layers well underneath my mid and outer layers. The wicking properties of the fabric have helped keep me warm and dry in a variety of conditions. The pullover is well designed with seams away from high abrasion areas such as the top of the shoulders. In addition, the zippered neck allows for extra ventilation or extra warmth as needed. The pullover is durable and I like the way the fabric resists odors. I consider it a great base layer for hiking, backpacking, and camping. This concludes my Field Report. My Long Term Report will be added to this report in approximately two months. Please check back then for more information. My first backpacking trip during this test phase was a weekend trip to Southern Indiana. As I hiked into camp around 4:30 pm the sky was overcast and the temperature was 31 F (-0.5 C) and windy. Although I generated lots of heat while backpacking, the pullover kept me comfortable and dry. After pitching my tent, I collected as many sticks and branches as I could find for a campfire that I would build once it got dark. As evening wore on, the temperature continued to drop and it began to snow. At this point, I exchanged my outer layer for an insulated jacket. Around 8:30 pm I retired into my tent and removed my outer layers before crawling into my sleeping bag. Usually I change into new base layers before crashing, but this time I did not. The next morning when I awoke the temperature was 18 F (-8 C). I spent a few hours around the fire before breaking camp. Once on the move, I backpacked for several miles before deciding where to camp the 2nd night. Daytime temperatures approached 30 F (-1 C) and the sun appeared for awhile, although the wind was quite gusty. My next outing wearing the Cloudveil pullover was northeast of Indianapolis at a Webelos Adventure Camp. I was there because my son was on a weekend campout with the Boy Scouts. The boys and adult leaders were cabin camping and had planned to work on a new Merit Badge that weekend. When I arrived at camp around 9:00am, it was sunny and breezy with a temperature of 28 F (-2 C). The wind increased throughout the morning and as the day wore on windchill became a significant factor. It was at this time that I was very glad I had worn additional layers of clothing. Many hours earlier while getting dressed I had made the decision to wear a midweight long sleeve PowerDry shirt under my pullover. This kept me warm in otherwise cold conditions. I spent the afternoon hiking throughout the campground which encompassed 300 wooded acres. At all times the pullover kept me comfortable. On occasions when I started to heat up, I simply unzipped my jacket as well as the pullover to cool down. Later that evening I shouldered my backpack and hiked back into the woods to find a suitable spot to pitch my tent. Using my headlamp, I hiked until well after dark before stopping for the night. Although the temperature was dropping quickly due in part to the clear night sky, I was able to generate plenty of body heat while packing and remained warm while setting up camp until retiring for the evening. The temperature at 6:00 am the next morning was 11 F (-12 C). While packing my supplies in preparation to break camp, I noticed that my sleeping bag was fairly wet and ice crystals had formed on the surface. I considered whether the pullover (which I had worn all day and thru the night) had released this moisture or if my body had expelled this moisture while I was sleeping. Either way, I remained warm throughout the night in my drafty 3 season tent and my pullover was dry in the morning. I have slept, hiked and worked in this pullover and am very happy overall with its warmth, comfort and durability. While using this pullover as a base layer in a three layer system (baselayer, warm layer, shell), my temperature comfort range extended down to 28 F (-2 C). When temperatures got colder, I added an extra layer underneath it and used this pullover as a mid layer with a fleece jacket and windproof shell on top. I found that I could regulate my body temperature while backpacking by simply opening the front zipper. The zipper has run smoothly the entire time and has never snagged. Cloudveil's pullover has done a wonderful job of keeping me dry which is in my opinion the most important consideration when selecting a base layer top. I have never gotten chilled from sweat while wearing it. I believe this is testimony to the breathability and moisture wicking capability of this fabric. Regarding comfort, the Power Stretch fabric has remained soft to the touch and not once have I been bothered by the seams. I must say that I really like the cut of this pullover and the stretchiness of the fabric. It has allowed me to layer fleece jackets, vests and shells over it without any problems. The pullover has held up nicely under the testing conditions. It still looks and feels like new even though its been worn extensively and washed several times. I�ve noticed no color fading, noticeable shrinking, or fabric wear. All the seams are in good shape including the ones where my pack hits. I have not seen any pilling of the fabric due to wear from the pack or from washing. It is proving to be quite durable. The Cloudveil pullover has been great to wear. It has become a favorite of mine this winter and I expect it will see continued use this spring and then again next fall when the temperature starts to drop. It is lightweight and yet it provides great warmth and comfort. It is soft against the skin and does a great job wicking moisture. Throughout my testing it never held any odors. It has become the first item I reach for when going outside. I will continue to use this pullover extensively until mid spring when temperatures become too warm for its use. In addition to backpacking, I have worn it while shoveling snow and more recently while jogging and bicycling. It is also great to lounge in at home and around the yard. Once temperatures warm up I will transition to short sleeves, but for now I am quite comfortable in it. I'd like to thank BackpackGearTest.org and Cloudveil for letting me participate in this test.